Kelleyanne Conway, the senior communications adviser to President Donald Trump, has an issue with her husband, George Conway. George is in the “Never-Trumper” camp, and he just trashed the president as being “unfit and unstable.” Well, that’s when President Donald Trump and an entire slew of famous supporters made Mr. Conway regret it. Don’t miss this. Kelleyanne Conway’s husband George has been poking President Trump on Twitter for quite some time. But this time he really took it a step too far, making national headlines. “Attorney George Conway says he hurls barbs at President Donald Trump on Twitter so he doesn’t ‘end up screaming’ at his wife Kellyanne, who serves as Counselor to the President,” Breitbart reports. “Conway, a Trump foe once under consideration for a top position at the Department of Justice, has ratcheted up criticism about the president in recent days, questioning whether his wife’s boss lacks the mental fitness to lead the country,” Breitbart added. Radio icon Rush Limbaugh weighed in during his Tuesday broadcast and dispelled the myth that the never-Trumper crowd is pushing about Kelleyanne. “Now, in Never Trumpville, the theory is — are you ready for this? 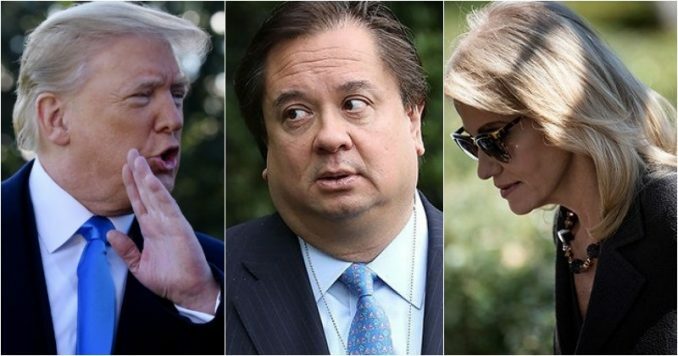 Three, two, one — that George Conway is only doing this because Kellyanne wants him to. That Kellyanne thinks Trump is crazy but can’t say it because she works for him,” Limbaugh began. It sure looks like George Conway has an issue with his own manliness. This guy makes an utter fool out of himself ever since his wife made it to the very top, and he just can’t seem to take it like a man. Instead, egged on we are sure by the other Never-Trumper’s like Bill Kristol, Ben Sasse, Jeff Flake, and John Kasich, Conway goes full tilt and posts the DSM-5 and make a diagnosis. He’s the one who looks like a looney tune. We feel for Kelleyanne Conway. She has been one of the best advocates for Trump taking on CNN and MSNBC without batting an eye. Maybe poor George needs a nice 30-day stay with real mental health professionals so he can get over his Trump Derangement Syndrome. It’s one of the worst cases we’ve ever seen.